Since we all can't drop everything and fly to Rome, what better way to celebrate Italy's 2006 FIFA World Cup victory over France than by filling our cups with gelato. 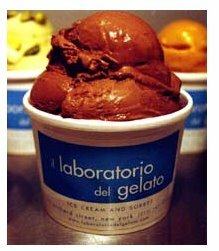 il laboratorio del gelato is a favorite. Even better, they'll conveniently ship your order the same day in Manhattan if you place it before noon and overnight otherwise. Chocolate lovers will go pazzo over their extensive list of modern flavors. I suggest the chocolate hazelnut, chocolate kahlua, thai chili chocolate, and milk chocolate malt makes a great shake! Enjoy!!! And congrads to Italy! Bravo Buffon!